If you need to confirm a sunspot sighting from 1917, who do you turn to? Citizen science project Old Weather is recovering worldwide weather observations made by Royal Navy ships and recorded in their log books. Recently one of the log books threw up a naked eye sunspot observation on February 10th 1917. 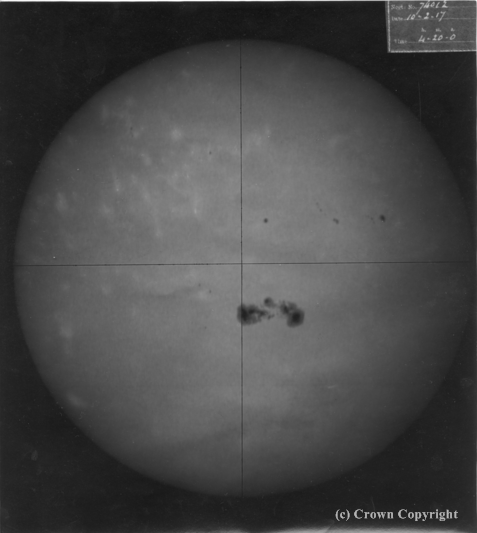 This is an image scanned from our archive of solar images taken by the Royal Greenwich Observatory and its out stations and it matches well with the description given in the ships log. "at noon aTS observed spots near centre of sun like this [diagram] it appeared to be two with a narrow passage between them, I make this note, for although I have seen sun spots before, I have never seen such large ones"
For more on this story, including an image of the log book entry, see the Solar Stormwatch blog post.